difficulties. Ideal for those with limited reach or range of motion. 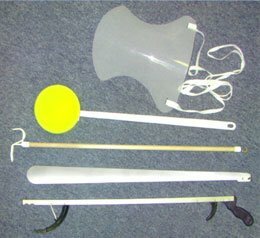 Kit consists of one each, 27" Dressing Aid Stick. 26" Aluminum Reacher with Magnetic Tip. 24" Shoe Horn. Sock Aid. 22-1/2" Long Handled Bath Sponge. Ideal for those with limited reach or range of motion. This kit was designed for those that may need assistance in reaching due to hip surgery, back surgery or anyone with bending or reaching difficulties.